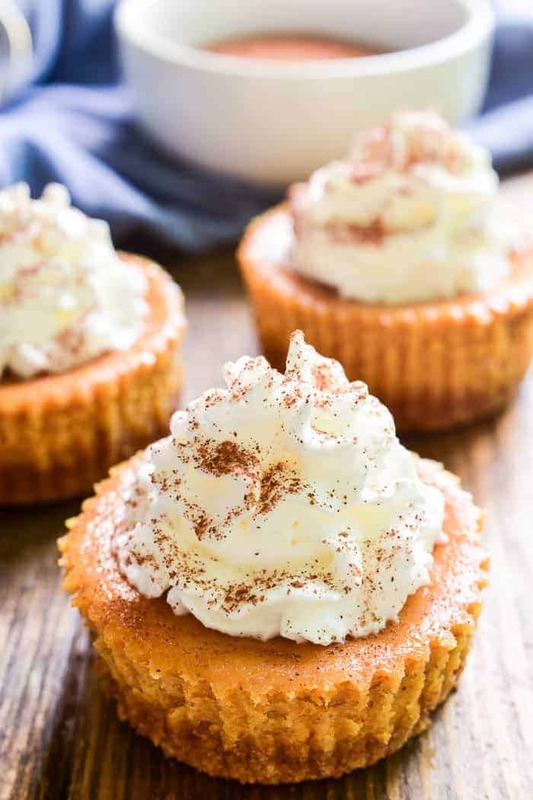 Mini Pumpkin Cheesecakes are the perfect dessert for any fall celebration! They combine all the flavors of pumpkin pie in a delicious bite-sized treat. 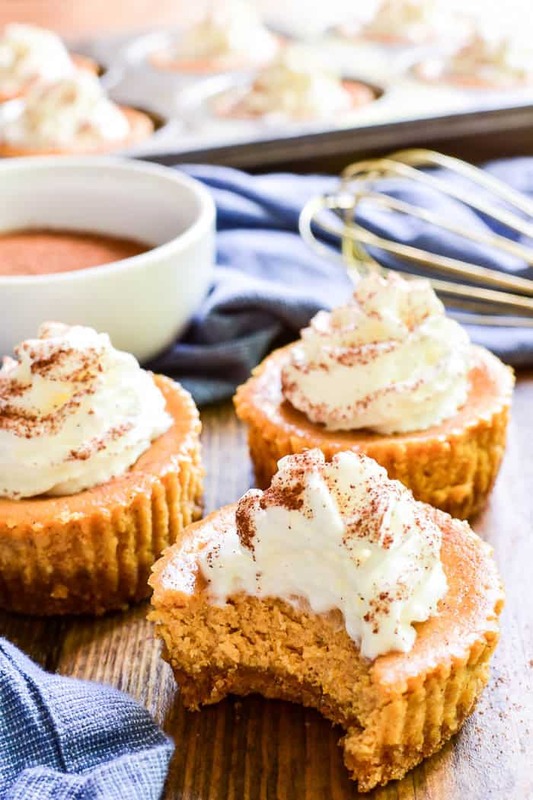 These pumpkin cheesecakes start with a sweet graham cracker crust and are filled with pumpkin cheesecake, whipped cream, and a sprinkle of cinnamon on top. And best of all, they combine two holiday favorites – pumpkin pie and cheesecake – in one awesome mini cheesecake dessert that’s sure to be a favorite! Does anyone else come from a family like mine? Where the dessert table is always *at least* as big as the meal? Seriously. I have never once been to a family function where there was only one dessert option. Usually it’s more like 3 or 4….or, depending on the day, 6 or 7!? There’s no hiding the fact that my family is dessert obsessed….which is both amazing and also incredibly dangerous. Because sometimes you just can’t choose between them. And if you don’t have to? Sometimes you might end up with a “small” piece of each. Of course, there are always some obvious choices. Homemade over store bought. Vanilla over chocolate…especially when it comes to cake. And always….always….cheesecake. I’m a HUGE fan of cheesecake and always have been. It’s so rich and creamy and satisfying, and when you get down to it, the possibilities for it really are endless. Like Mini Amaretto Cherry Cheesecakes or Apple Cheesecake Parfaits or Cherry Cheesecake Gingerbread Trifle or these Mini Pumpkin Cheesecakes….the list goes on and on. And let’s not forget the amazingness of a basic cheesecake. No fuss, no frills. This No-Bake Cheesecake Recipe? Yes, please! Why bake if you don’t have to!? But. When we’re celebrating the holidays, and cheesecake is on the table, and so is pumpkin pie….I must admit the choice is never obvious. It’s not a holiday without pumpkin pie, but cheesecake is definitely my favorite. Mini so you can still enjoy the rest of what’s being offered. Pumpkin + Cheesecake because BOTH are necessary elements of a holiday dessert table. These Mini Pumpkin Cheesecakes really are the best of both worlds. They combine all the flavors of pumpkin pie in a rich, creamy cheesecake. And let’s not forget about that graham cracker crust. Top them with whipped cream and cinnamon and you literally have the ULTIMATE holiday dessert…in bite sized form. And you can find everything you need to make these little cuties at Pick ‘n Save! 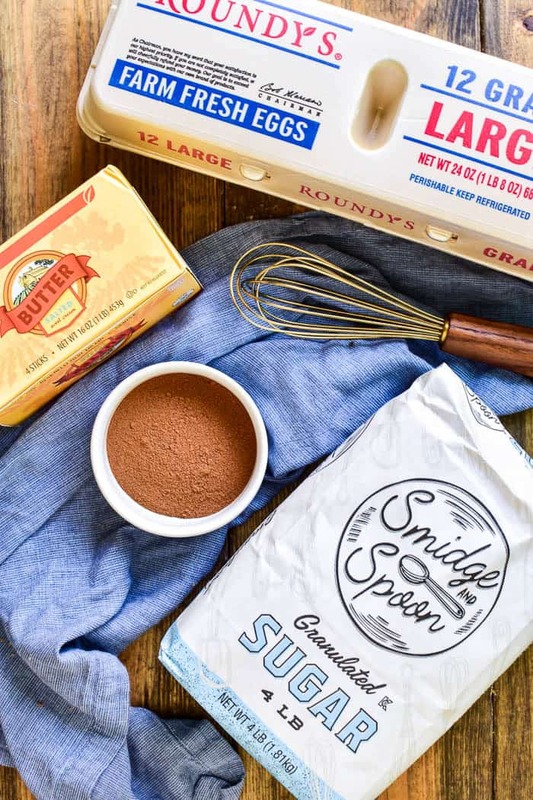 From the graham cracker crumbs to the Smidge & Spoon sugar to the Roundy’s eggs, produced right here in Wisconsin. I love the fact that Pick ‘n Save is a one stop shop and that they always have everything I need. With the holidays quickly approaching….it’s exactly what I need! 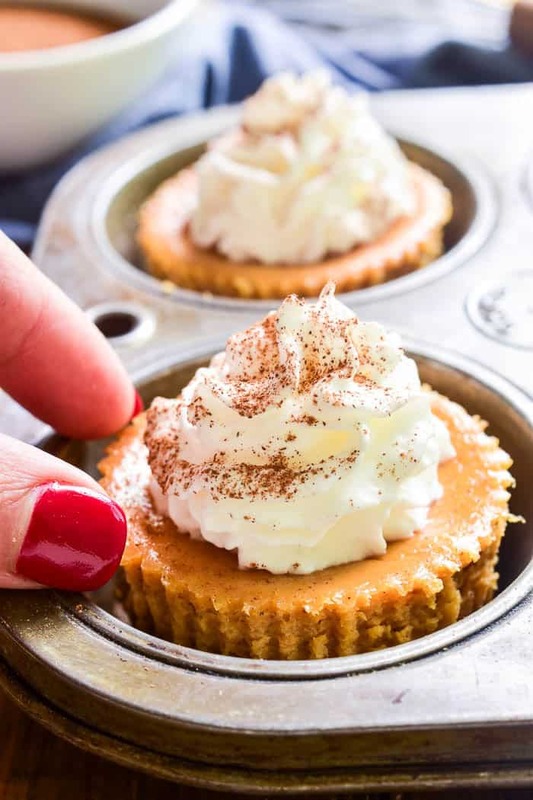 HOW DO YOU MAKE MINI PUMPKIN CHEESECAKES? In a medium mixing bowl, combine graham cracker crumbs, 1/4 c. sugar, 1/4 c. brown sugar, and melted butter; mix well. Divide evenly among 24 muffin tins (approx. 1 1/2 Tbsp. each) and press down firmly. Chill while filling is being prepared. In a large mixing bowl, combine pumpkin, 1/2 c. brown sugar, eggs, cinnamon, nutmeg, ginger, and salt. Mix well. In a separate bowl combine softened cream cheese, 1/2 c. sugar, and vanilla. Blend until creamy. Combine the pumpkin mixture with the cream cheese mixture; blend until smooth. Scoop 1/3 c. filling into each muffin cup. Bake at 350° for 25-30 minutes or until centers are set. Cool on a wire rack; refrigerate, covered, 2-3 hours or until ready to serve. HOW DO YOU STORE CHEESECAKE? These Mini Pumpkin Cheesecakes can be stored in the refrigerator, covered, for up to one week. They can also be stored in the freezer. To store cheesecakes in the freezer, wrap them in plastic wrap or aluminum foil and place them in a heavy duty freezer bag. 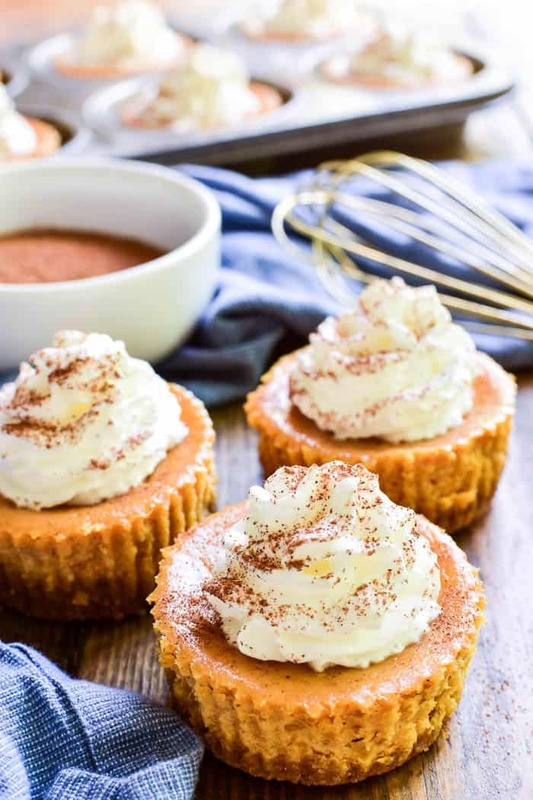 Mini Pumpkin Cheesecakes are the perfect dessert for any fall celebration! They combine all the flavors of pumpkin pie in a delicious bite-sized treat. 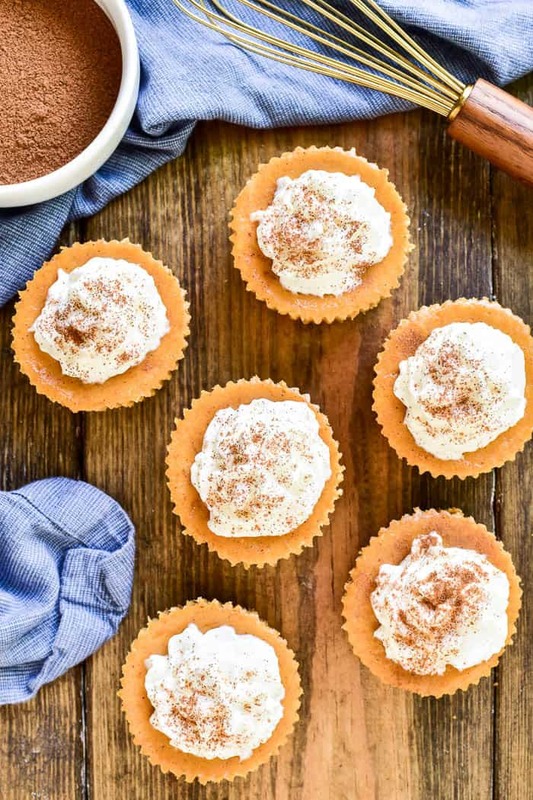 These cheesecakes start with a sweet graham cracker crust and are filled with pumpkin cheesecake, whipped cream, and a sprinkle of cinnamon on top. And best of all, they combine two holiday favorites - pumpkin pie and cheesecake - in one awesome dessert that's sure to be a favorite! For more recipe inspiration, visit Pick ‘n Save on Twitter, Facebook, YouTube, and Pinterest. You are using smooth sides cupcake tins but the cheesecakes look like they were done in cupcake papers. Is that what you have done? Are they difficult to get out of the tin without the papers? Thanks! great entertaining recipe, different too (at least for me) a good kind of pumpkin recipe, thank you, much appreciated! Should a person use a liner or just spray the muffin pan well? These little cheesecakes are simply adorable! Such a great alternative to pumpkin pie! Individual servings are awesome, these are adorable! I love mini dessert, and I love pumpkin – these are perfect for me! Mini desserts are my favorite for holiday entertaining! You don’t feel bad taking 2 or 3 or 5, haha! Looks absolutely delightful! So much flavor packed into each bite, can’t wait to try! Yum! The perfect sweet treat for fall! Do you use the mini muffin pan or the regular muffin pan? Do you use a muffin/cupcake liner for these? Just made these and they turned out great! (I used cupcake liners just to play it safe). Going to try to make a larger version – wished there was a recipe for that so I know what ratio of filling and crust to use but I guess I’ll have to do a bit of experimenting on my own.